Warning! A potentially huge SPOILER awaits you if you tread any further down this road. Hold your breath. Dive forth at your own description. Following the death of her character earlier this year in Avengers: Infinity War, Zoe Saldana has posted a video of herself getting back into her Gamora makeup yet again. It would seem that Saldana is on set for the Avengers 4 reshoots, which most Marvel fans interpret as one thing: Gamora is coming back! The video clip of Zoe Saldana getting into her Gamora makeup was first shared on her Instagram story, and sadly is no longer available to be seen on her profile simply due to the nature of the site. Presumably, Saldana and the people at Marvel don't think that her post is too "spoiler-ific," so perhaps however Gamora shows up in the movie won't be too much of a shocking twist. 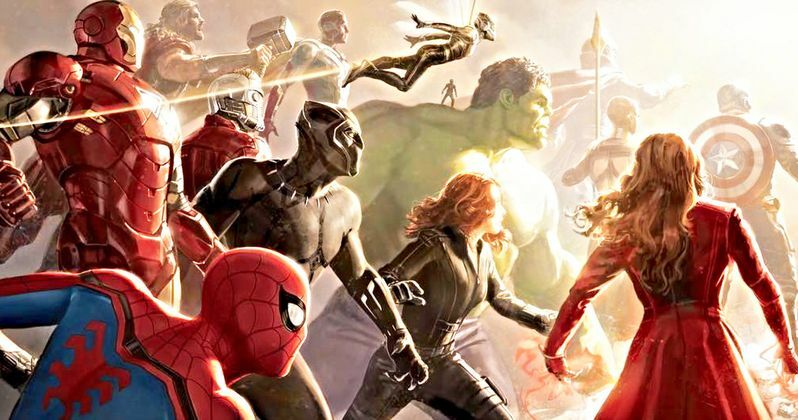 Infinity War featured the deaths of a number of popular heroes, including fan favorites like Spider-Man, Groot, and Loki. However, while many of these deaths were noticeably reversible, specifically the characters that turned to ash, some of the character deaths seemed permanent. Gamora is one of those seemingly permanent deaths. The death of Gamora spawned a number of debates online, with many fans insisting that the popular Guardian of the Galaxy will come back, and that she's actually alive within the Soul Stone. Other fans, however, insisted that Gamora's death was permanent. While this video posted by Zoe Saldana doesn't exactly prove either side wrong or right, it definitely does help the "Gamora will come back" argument. It's quite possible, however, that Gamora will remain dead, at least during the events of Avengers 4, and that the Avengers reshoots that Saldana was a part of were merely for flashback scenes showing more of Thanos's past. There's also the possibility that Gamora's reshoots could have to do with the Avengers 4 rumors that the movie will deal heavily with time travel, potentially showing the Avengers re-doing the events of Avengers: Infinity War. The biggest theory regarding Gamora is that she is alive inside of the Soul Stone, which has been known to keep its victims alive in the comics. A few months back, the Russo brothers seemingly confirmed this theory by saying that the scene towards the ending where Thanos talked to a younger Gamora did take place within the Soul Stone, further implying that Gamora's soul is floating around somewhere inside that particular Stone. Presumably, this is also where all of the heroes that turned to ash are being stored, so it's possible that Gamora could come back when (or if?) the rest of the heroes return. It's been heavily rumored for months that Gamora will be returning in Avengers 4, so it's nice to finally get some confirmation on the matter. A majority of the initial production and the reshoots for the fourth Avengers movie have been kept absolutely quiet, so behind the scenes pictures or videos like Saldana's don't typically make their way across the Internet, making her makeup video a breath of fresh air in context. The video itself is now viewable on Reddit. Even if we don't know exactly how Gamora will be making her way back to the big screen, it is still exciting to know that this beloved Guardian of the Galaxy will be coming back when Avengers 4 hits theaters on May 3rd, 2019.